Members of the audience got to ask the four Democratic candidates questions directly. 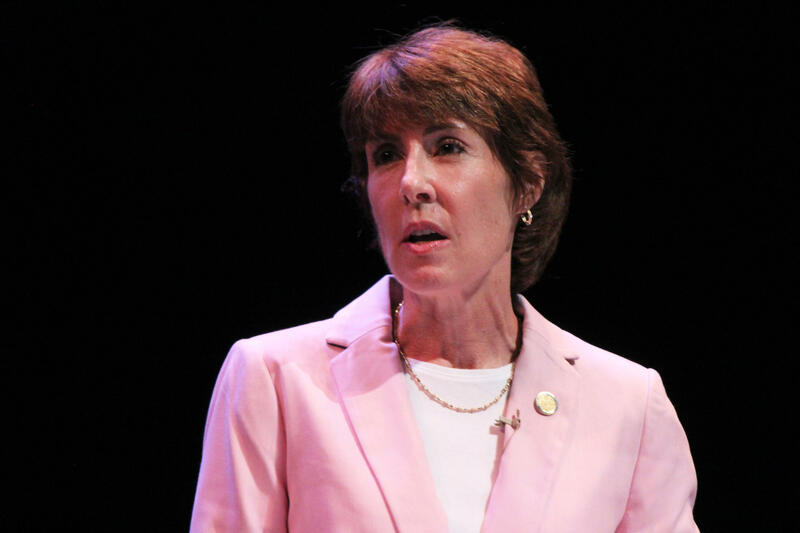 Former U.S. Representative Gwen Graham responds to audience questions during the Democratic primary gubernatorial debate in the Miramar Cultural Center on Monday, June 11, 2018. Tallahassee Mayor Andrew Gillum answers an audience questions during the Democratic primary gubernatorial debate in the Miramar Cultural Center on Monday, June 11, 2018. 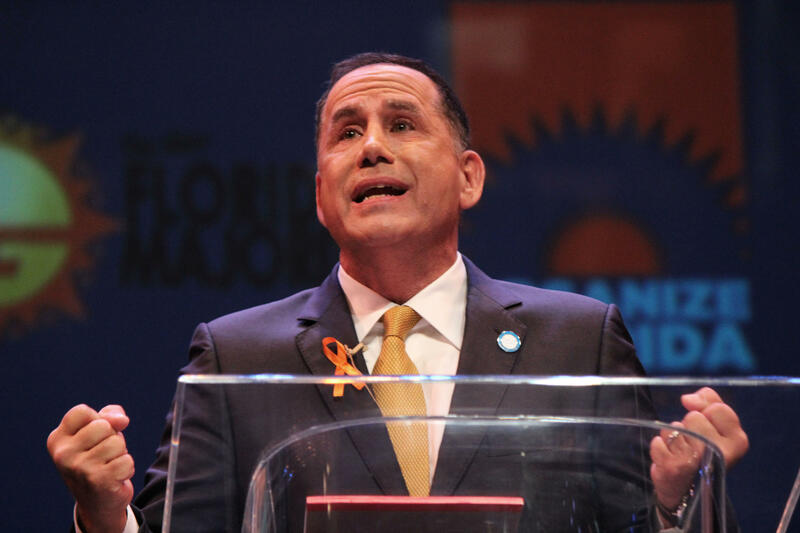 Former Miami Beach Mayor Philip Levine answers an audience questions during the Democratic primary gubernatorial debate in the Miramar Cultural Center on Monday, June 11, 2018. 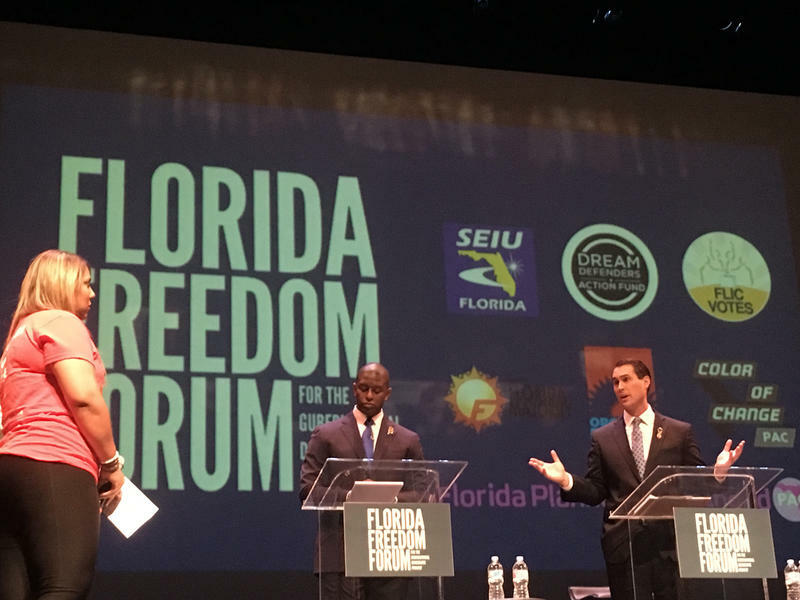 Orlando entrepreneur Chris King answers an audience questions during the Democratic primary gubernatorial debate in the Miramar Cultural Center on Monday, June 11, 2018. Floridians react to the 2018 Democratic gubernatorial debate and audience questions. 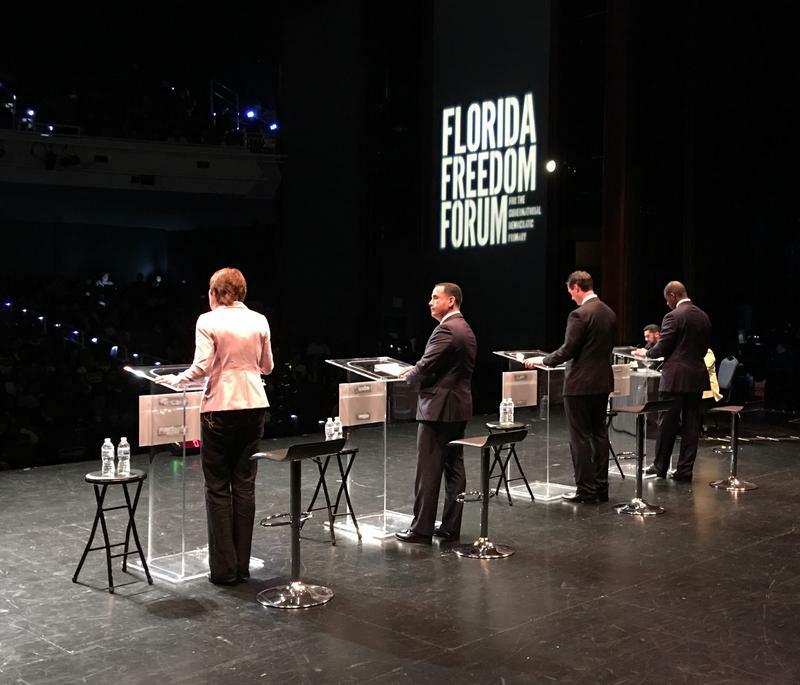 The Florida Freedom Forum debate included four of the Democratic candidates to be the next Florida governor: Tallahassee Mayor Andrew Gillum, Former U.S. Representative Gwen Graham, Orlando entrepreneur Chris King and Former Miami Beach Mayor Philip Levine. 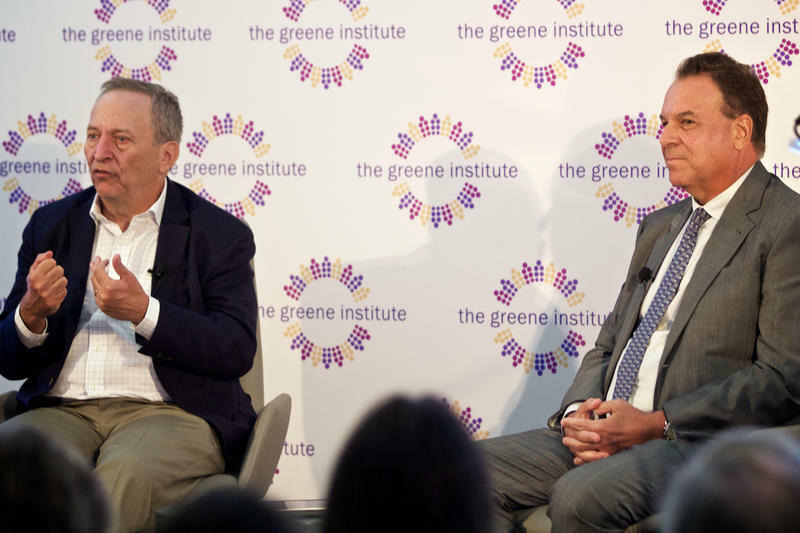 Billionaire and candidate Jeff Greene didn't qualify because he announced his campaign too late. Some of the questions to the candidates were posed by the moderators, WLRN's Luis Hernandez and PBS Newshour's Yamiche Alcindor. Activists and community organizers were also invited on stage to ask about topics like the state's affordable housing, teacher's salaries, women's reproductive rights and supporting the Puerto Rican community seeking refuge in Florida after Hurricane Maria. Broward resident Elizabeth Bercaw prepared to walk on the stage and represent a woman's right to choose. Her 30 years of volunteering for Planned Parenthood led to her question about the Florida government’s attack on abortion access. She described state funding and taxpayer dollars going towards “fake clinics,” that in her eyes are designed to trick women with unwanted pregnancies who are really searching for medical care and guidance. “What they get is a religious reading of that person's, or those volunteer’s interpretations of what these women should or should not be doing with their body,” Bercaw said. “These centers are set up to again deter access to abortion. And the worst part is they’re getting state funding." Broward College adjunct nursing professor Nancy Fernandes also prepped in the wings. When her turn came, she walked on stage and directed her question to all four candidates. Fernandes said her question was inspired by seeing the harsh reality of another adjunct professor in nursing. With all of her degrees and years as an educator, she said her colleague didn’t have enough money to even stay in a motel with her child. London Faye, a hair stylist who constantly sees fed-up educators in her salon chair, sat in the audience. She said that question stuck with her. QUESTION (from Vamos 4 Puerto Rico): I know that now in Florida we are going through a housing problem that has increased after people like us, arrived from Puerto Rico arrived after hurricane Maria. Right now there’s a lot of Puerto Rican families in motels, or worse, are homeless. 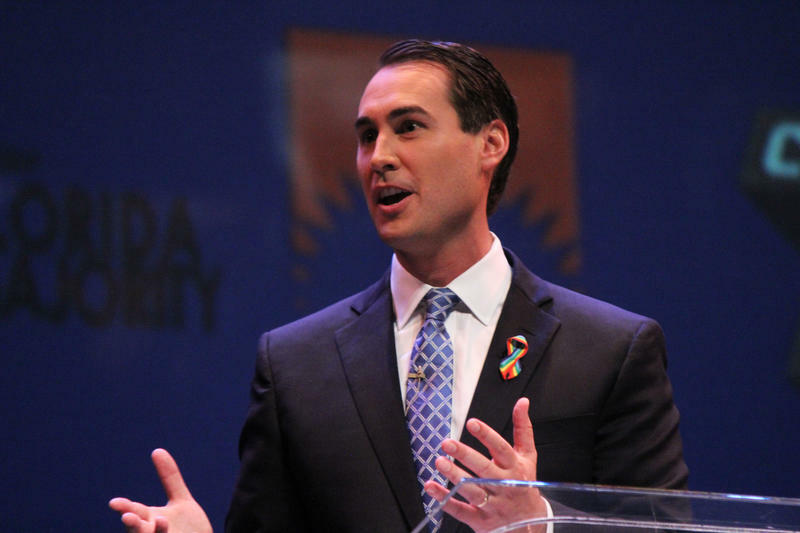 What is your plan to address housing costs in Florida for my community? Andrew Gillum: Let me first say, we all ought to be embarrassed by this President’s behavior [Donald Trump's]. If there’s a bright spot to it, I think he learned that Puerto Rico is part of the United States. There was an important geographical lesson there. We’ve got to increase, as a neighbor, to our fellow Puerto Rico. We’ve gotta increase the housing vouture inventory. We’ve gotta ensure there’s job training and what we like to refer to as reciprocity for those who have credentials on the island, that those credentials are able to be accepted here in the United States mainland. Chris King: What we have to do is amplify this issue with every bit of our heart, soul and mind to bring attention to those families in the short term. But in the long-term, we have an affordable housing crisis all across Florida. And we need a governor who understands it, who’s willing to fix it and who’s willing to invest the resources into caring well for those families. Gwen Graham: I spent a day working at a Puerto-Rican owned grocery store. During that day, I had a chance to go across the street and see where one of the families was living. This was a mom with 3 very large boys, living in a hotel room. And she said, 'Gwen, I can’t find the housing that I need.' We've got to be investing in affordable housing and investing in opportunities for those who have moved here from the island of Puerto Rico. Philip Levine: What happened with this President was an embarrassment not only to our country, it was an embarrassment to the world, the way he handled this relief effort. I was the first private person to land an aircraft in San Juan with the great representative Robert Asencio who was with me on this mission, together, when we were there with the mayor with San Juan. We did it, and we did it because it was the right thing to do. QUESTION (from Nancy Fernandes, Adjunct Professor at Broward College) : Every day I see the impact of a broken higher education system. Budget cuts in Tallahassee mean more families are drowning in student loan debts. And my colleagues, many who have Ph.D.’s, make poverty wages. So my question - will you commit to reinvest in education and educators by fully funding free universal college for all Floridians? Andrew Gillum: I hope you are successful in being able to unionize. These are attacks that year after year after year the governor has shown he’s had no priority for our community college system. Every year practically during his administration he’s diverted more and more money away from it. Chris King: I think the state college system is extraordinary and represents an extraordinary opportunity to change the state of Florida. And that’s why early in my campaign I came out for free community college and trade school for all Floridians. 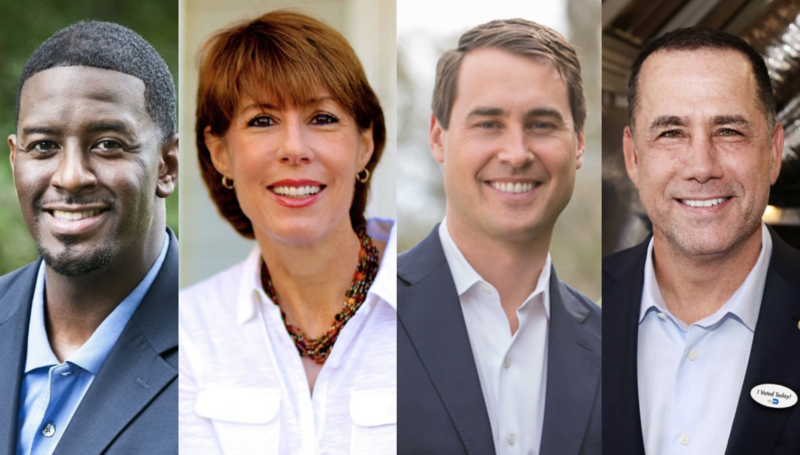 Gwen Graham: I’m going to make sure community and state colleges have the resources that you need to pay teachers what they deserve, faculty what they deserve, and to give those students who are coming out of 12th grade an opportunity to go to one of these gems, continue their education and keep their debt low. What I would like to do is have technical training in our schools, apprenticeships available that are also going to be able to feed into the community colleges. Philip Levine: My belief is, we need to make sure everybody can go to college because we have no idea who the next Einstein is in any of our schools. QUESTION (from Elizabeth Bercaw, Planned Parenthood, Florida) : Year after year, state leaders have attacked abortion access in Florida. What will you do to proactively protect abortion access in this state? 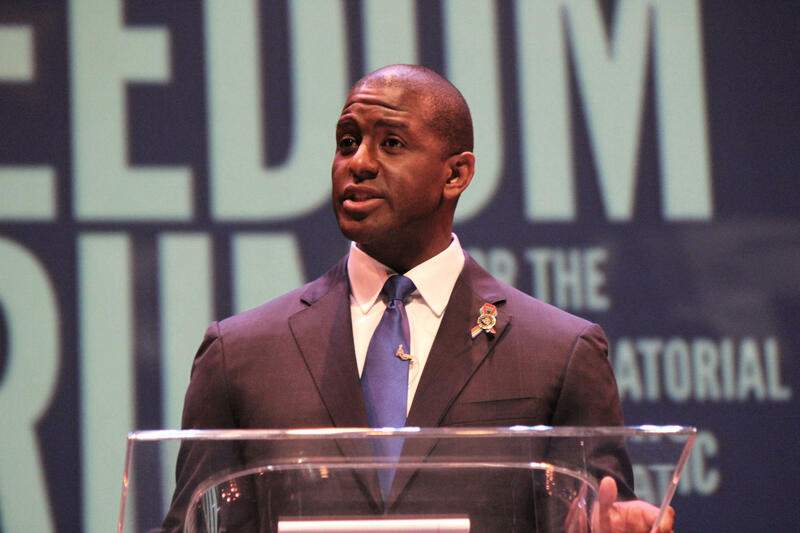 Andrew Gillum: I am the only candidate in this race so far who has proposed Medicare for all. We’ve got to make sure that we extend the ability of health and health access to all people. I believe women should be solely responsible for their own reproductive health decisions and the government should stay its way out of it. Finally, I’ve been an advocate for no-cost contraception. Chris King: We have to fight every attempt to criminalize abortion. I believe in pro-choice. I will stand up for access to contraception and health care for all women. I will support Medicaid expansion. We’ve had a toxic culture towards women in Tallahassee, particularly during this last session. And I think the next governor sets an example. Gwen Graham: As a woman, it’s time we have women at the table to fight for women’s healthcare issues. I’m so proud to have 100 percent rating from Planned Parenthood. And this is something that when I’m governor, any bill that comes across my desk that in any way strips the right of a woman to have the healthcare that she needs, I will take out my red pen and I will veto it immediately. Philip Levine: Our government has no place in a woman’s body, ok? That’s number one. And number two, I believe firmly in every woman’s right to choose. But I think the question is going to come down to the courts. We have three important Florida supreme court justices that the next governor of Florida will hopefully have the opportunity to appoint. We need to make sure those three judges are fair, they have integrity and they have knowledge of the law. "If you could wave a magic wand and have the governor do one thing, what would it be?" That was among the questions asked of those attending Monday's Democratic primary gubernatorial debate. The Color of Change political action committee passed out bingo cards as an ice-breaker for representatives of different Democratic organizations at the event. 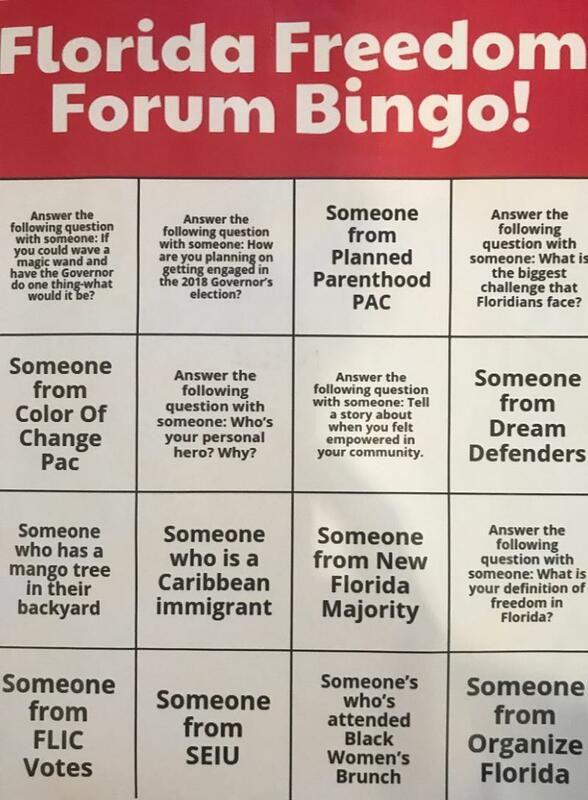 The bingo cards prompted attendees to answer questions about challenges facing Floridians and what they are looking for in a governor.